Beautiful, calm, obedient – Nikita had no future as a sled racing dog, and an abusive owner in Alaska until RJ “stole” her. Friday the 13th turned out to be quite a special “Dog Day” here at Rita’s Rest Home for Wayward Dogs. 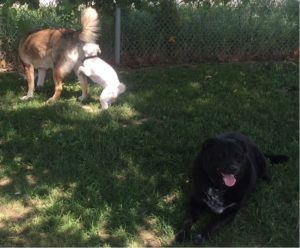 Forest, Leia, Rosie and I paid our first visit to the Bowmanville Leash-Free dog park, where we met up with Dalmations, Labs, a Bassett Hound and a Mastiff presciently named “Ruckus.” Tiny Maltese Rosie held her own with all of them. The highlight of the adventure, however, was definitely meeting Nikita, a born-and-bred Alaskan sled dog who is actually one-quarter wolf. I need to preface the Nikita story – very sad beginning, very happy ending – by offering a belief that I have long shared with my brother Pete about dog souls. Human beings only think they are the ones in charge when it comes time to find a dog; in fact, somewhere out in the Universe a dog’s soul is looking for YOU. When that soul and the dog in which it resides (albeit, temporarily) locates you, you may persuade yourself that you’ve reached a logical, rational executive decision to acquire a dog. Meanwhile, that dog soul has been looking for you, has located you, and has no plans to let you get away. Upon arrival at the dog park, I scanned the perimeters of the field for other dogs; Rosie is very small and sometimes a bit nervous, although that passes quickly. When I spotted Nikita laying in the shade with her owner all the way across the field, I was automatically a bit worried about whether or not she was friendly to other dogs, as not all Husky/Malamutes are. After the initial introduction, Rosie was not at all intimidated by Nikita and in fact was quite curious about her. Forest sensed no problem. Wandering along the fence, pre-occupied with picking up dog poos, I did not even notice quiet, stealthy Nikita cross the field; when I looked up, she was sitting in front of Rosie and wagging her bushy tail furiously. With one bright blue eye and one brown, she has an exotic, mysterious look. She seemed to know better than to run or jump around Rosie the way a more obliviously enthusiastic dog would. Before I had time to get anxious, her owner walked up. “How did she get here?” I gasped. “I stole her,” RJ shrugged philosophically. “I was in Alaska, fishing with a buddy who has a boat there. One day we were sitting high up on a hill, and I could see a fenced-in property below us. RJ went on to explain that dogsled racing is a huge business and important part of the economy in Alaska; Nikita had been bred and was being raised to race in the Iditarod, the world-famous race which takes place between Anchorage and Nome every year. “Humans seem to love it, but it is a cruel and awful life for the dogs,” he said. I could feel the anger starting to rise in his voice. “They spend the first four months of their lives chained to a post on a chain about 3 feet long…they are not pets. Every so often, the owner walks through the yard with a taser and shocks them, to keep them mean. Dogs die running the Iditarod. Nobody cares. I nodded sadly: “I caught about an hour of the finals on TV last year,” I agreed. “It looks just brutal for the dogs. Walt Disney even made a movie about it, ‘Snow Dogs,’ it was so happy and looked like so much fun.” In the real Iditarod in 2017, four dogs died of exhaustion. In 2016, one was run over by a snowmobile. “The breeder didn’t like Nikita – she is small and too submissive, not mean enough,” RJ continued, obviously upset now. “One day I saw him kick her through the air, right across the yard. That night, I hopped the fence and stole her. “That’s very true!” he laughed, ruffling her head and ears as she gazed up at him adoringly. I read once about the fact that there must have been something very special about wolves, because aeons ago human beings were inspired to share their food and the warmth of their campfires with them as the very first domesticated animals. Not cats, not bears, not birds, not deer. Wolves. Humans have been providing food and shelter, and the descendants of wolves have been sharing love, loyalty, companionship and protection ever since. Our souls have been entwined for a very long time. 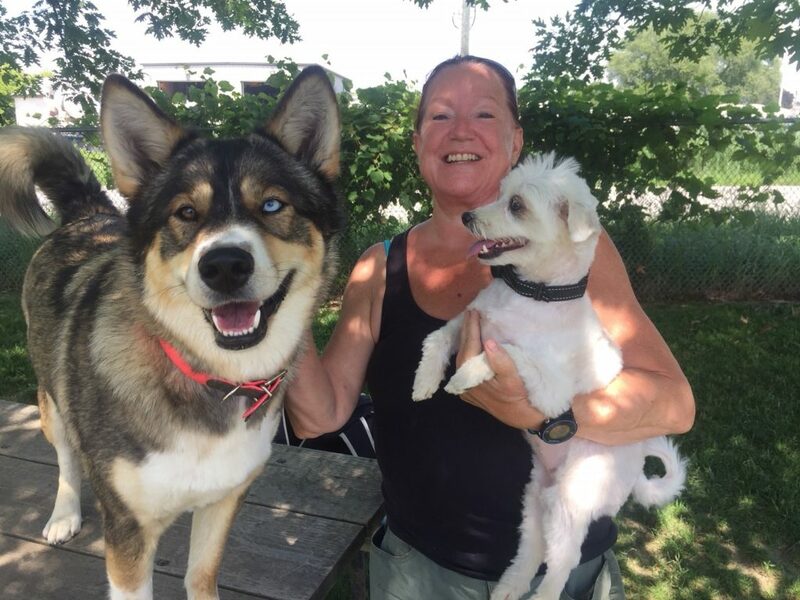 Stop to imagine: every single dog in that dog park, whether sleek Dalmation, jolly Labrador Retriever, massive Mastiff, baying Bassett Hound, or lap-dog Maltese – traces its ancestry back to the wolf. Vastly different in size, in intelligence, in personality and in demeanor, all those dogs came from the same original dog, the wolf. It was very special, to have Nikita there to remind us of this miraculous fact. In a symbolic way, she represents the Mother of all Dogs. It was a nice Friday the 13th. All dogs are descended from wolves – even Rosie. 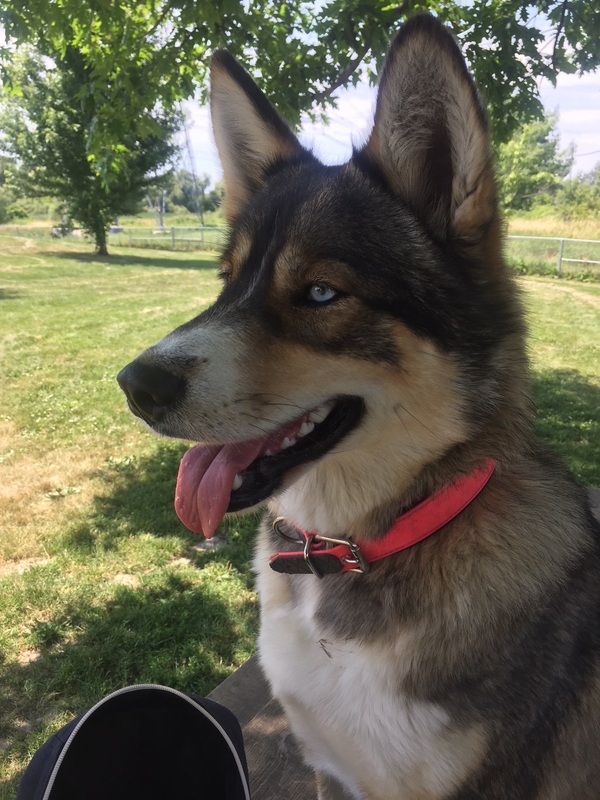 As far as I know, it is not legal to own a wolf hybrid in Ontario, although they are very common in the north where unsprayed female dogs breed with wolves on a regular basis. They are less common in other areas. In Alberta, owners with a special license are allowed to own wolf hybrids.